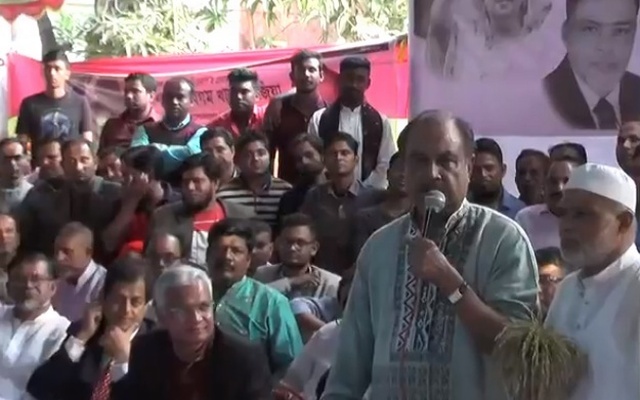 Jatiya Oikya Front senior leaders launched the alliance's first election road march towards Mymensingh region from the capital's Uttara area on Saturday to drum up public support in favour of the candidates of the 'Sheaf of Paddy'. Dr Kamal, who was supposed to lead the Oikya Front team, could not join the road march due to his illness. The alliance leaders, led by Jatiya Samajtantrik Dal (JSD) president ASM Abdur Rob, started their journey for Mymensingh from Uttara's Jasimuddin Road around 2pm. BNP standing committee member Nazrul Islam Khan, vice-chairmen Selima Rahman and AZM Zahid Hossain, Krishak Sramik Janata League president Abdul Kader Siddiqui, Nagorik Oikya convener Mahmudur Rahman Manna and Gonoshasthya Kendra founder Dr Zafrullah Chowdhury, among others, joined the road march programme. They held their first election rally in front of BNP candidate Salahuddin Sarker's residence at Tongi of Gazipur and sought vote for him. Speaking at the programme, Rob said the ruling party is trying to 'stay aside' from the election race fearing a defeat. "They're looking for a way to halt the election." He urged people to cast their votes for Salahuddin Sarker, a BNP candidate for Gazipur-2 constituency. The Oikya Front leaders are scheduled to hold six more rallies during the road march which will end on the premises of Sherpur municipality Park. Earlier on December 12, the Oikya Front, a major opposition alliance led by Dr Kamal Hossain, formally flagged off its election campaign from Sylhet through offering fateha at the shrine of Hazrat Shahjalal (R). Later, they offered fateha at the shrine of Shah Paran (R) and conducted electioneering in Sylhet city in favour of the 'Sheaf of Paddy'.